I wrote this post just before the Hungarian election with the intention of publishing it shortly after. But the announcement that Gábor Vona, the leader of the fascist Jobbik party, was resigning makes this post even more interesting. The postscipt explains why. Further down the street there’s another sign. This one has three images placed inside three red “no go” signs. The first is the outline of a mosque, the second depicts a women wearing a burqa and the third has two interlocking male gender symbols and two interlocking female gender symbols. The meaning is clear to all: no mosques, no Muslims and no LGBT+ people here. Welcome to the town of Ásotthalom in southern Hungary. The mayor of this town is László Torockai, the vice-president of the nazi Jobbik party – or “movement” as it likes to call itself. It has become fashionable – in some quarters – to claim that Jobbik is no longer a nazi party. But László Toroczkai’s fascist credentials are long and are there for all to see. Toroczkai led the gangs of football hooligans and neo-nazis who laid siege to the public TV station in Budapest in 2006. He was the founder of the Hungarian 64 Counties Youth Movement (HVIM). The HVIM is a paramilitary group with close ties to Jobbik – and to Golden Dawn, Ukrainian fascist paramilitaries and Betyársereg (Army of Outlaws), a Hungarian black-clad “self-defence force”. We will not permit aberrant foreigners of this or that colour to force their alien and sick world on Hungary. We hereby publicly declare that we, ourselves, will defend the Hungarian capital. 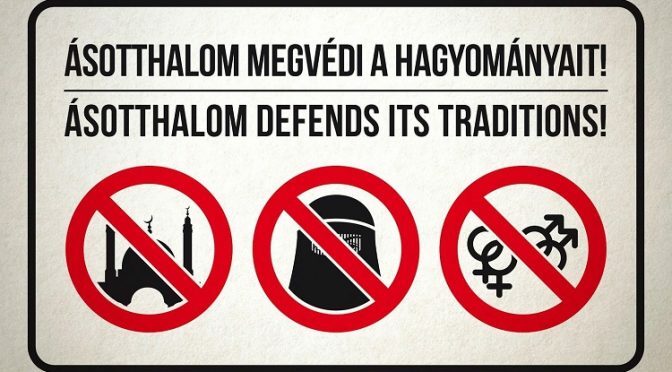 Every Hungarian patriot is needed! The pride march was brutally attacked by fascist thugs. Under the leadership of Toroczkai the HVIM organised weapons training camps and provocative marches in Roma communities. Toroczkai and HVIM organise the annual 10,000-strong Magyar Sziget festival – the largest gathering of Nazis and racists in Europe. It is a cross between a music festival and a mass political rally. I have also had my dealings with the HVIM. A few years back I went with my translator to the town of Gyöngyöspata to report on the anti-Roma attacks taking place there. As we approached the Roma settlement we were attacked by a group of HVIM supporters. One was carrying an axe. Toroczkai resigned from the leadership of HVIM in 2013 when he was elected on the Jobbik ticket as mayor of Ásotthalom. His victory was overwhelming, with 71.5% of the vote. 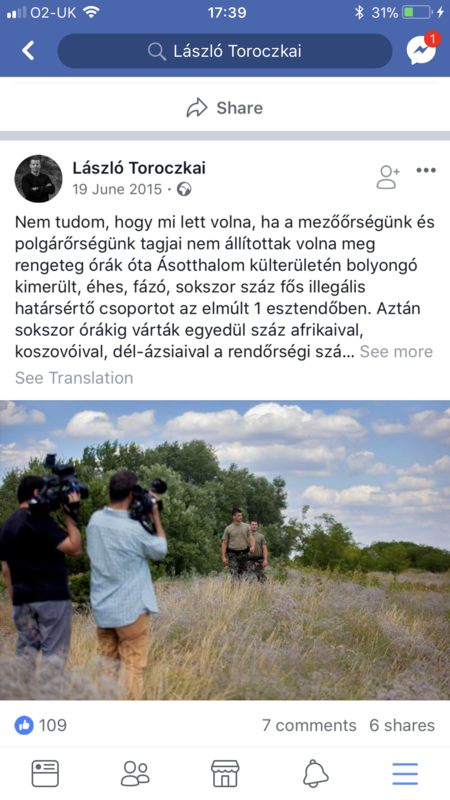 Ásotthalom is on the Serbian-Hungarian border, and because it was one of the main entry points into Hungary it found itself at the centre of the “refugee crisis” that dominated Hungarian politics in 2015-16. According to the European Commission between 2015 and 2016, around 2.6 million refugees attempted to come to Europe. Approximately 350,000 people attempted to gain access through Hungary. More than 80% of these were escaping the worst crises in the world: they fled from Syria, Afghanistan and Iraq. The remaining 20% came mainly from countries such as Pakistan, Somalia, Eritrea and Iran – countries with horrific human rights records. The far right racist populist Fidesz party governs Hungary, and has just won a “supermajority” again in last week’s general election. It talked about the country being “swamped by foreign hordes”. In reality the vast majority of the refugees arriving in Hungary moved on very quickly. Most were using it as a route into Germany, Austria and other richer European nations. The charity Open Foundations Society (founded by George Soros, who has become a key scapegoat figure for Fidesz) estimated that half of refugees stayed in the country for only one or two days. Only 1.5% of Hungary’s population has migrant or refugee status – one of the lowest rates in Europe – and most of these come from neighboring countries. According to government statistics only 146 applicants were granted asylum in Hungary in 2015. Viktor Orbán and his Fidesz government launched a vile campaign against the refugees. He told the media that Muslims were not wanted in Hungary and that he was defending the EU’s external frontier as a Christian against a Muslim invasion. Orbán’s foul words were accompanied by brutal deeds. 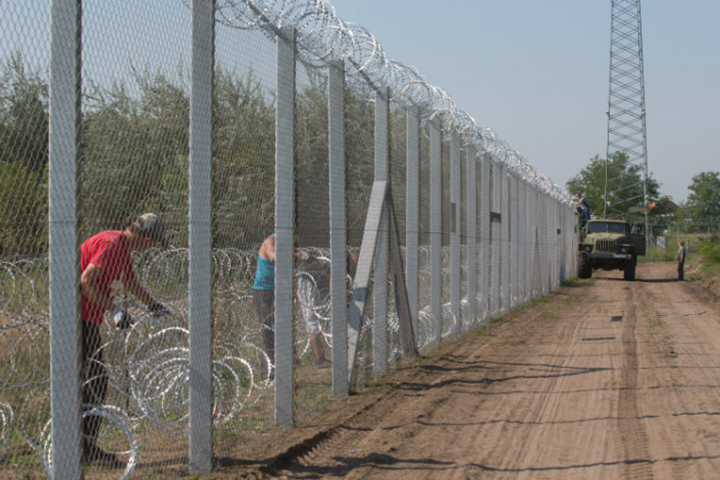 To deter refugees, the government built a 175km fence spanning the border between Hungary and Serbia. 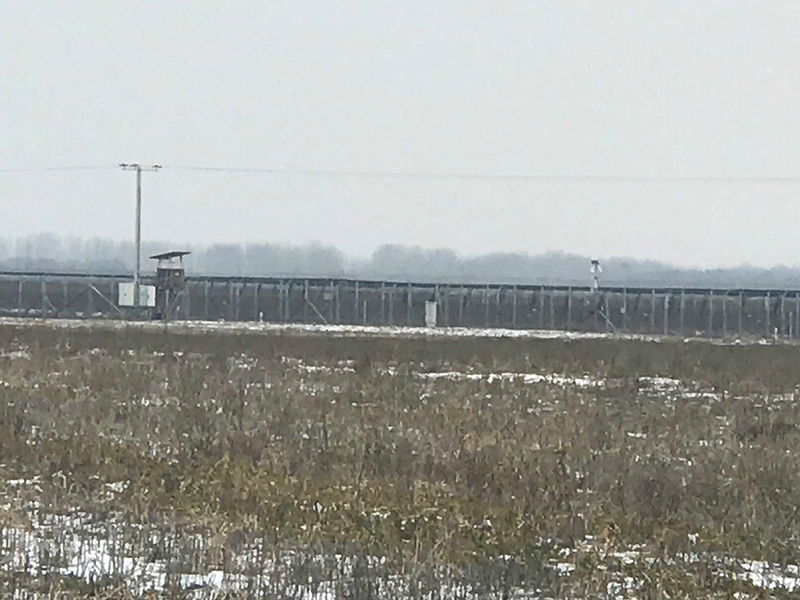 Orbán encouraged the world’s media to come to Ásotthalom to marvel at his fence and watch his border guards attack and arrest refugees. The refugee crisis was a major turning point for Fidesz and Orbán. It marked the party’s shift to cementing itself as a far right authoritarian nationalist party. Back in Ásotthalom, Toroczkai used the “refugee crisis” to promote his mayoralty and at a local level outflank Fidesz. In interviews he labeled the refugees “invaders” and “future terrorists”. He launched a 24-hour armed and uniformed civilian patrol whose mission was to “capture” migrants. According to Hungarian law these patrols are legal and these men have the right to carry guns so long as they don’t fire them. On Toroczkai’s Facebook page he has posted pictures of his vigilante patrols. One picture – which he has since deleted – showed three captured refugees lying on the floor face down, their hands tied with cable ties (see image below). The second showed a film crew filming his uniformed thugs. One of the images that was published on Laszlo Torockai’s Facebook page. It has now been taken down. Another screenshot from Toroczkai Facebook page. In 2017 Toroczkai and the Jobbik-controlled Ásotthalom council passed local bylaws that banned the wearing of the hijab and the call to prayer. It also outlawed public displays of affection by LGBT+ people. Toroczkai is also trying to being bring in legislation outlawing the building of mosques. Toroczkai boasts that his town is spearheading “the war against Muslim culture”. Only two Muslims live in the town, according to census figures. His council is trying to attract far right white Europeans to live there. And the ex-leader of the British National Party, Nick Griffin, lived there – before he was expelled by the Hungarian government. Over the past few weeks the Guardian newspaper and a number of liberal political commentators argued that a temporary electoral pact between the centre-left parties and Jobbik should be created in order to defeat Fidesz in the parliamentary elections on 8 April. But this is a dangerously mistaken strategy. Jobbik has been trying to present itself to the media as a “modern nationalist party that rejects the chauvinism of the 20th century”. The fact isn that up close and in power Jobbik is a violently racist and homophobic party. It is a fascist party with fascist friends. This leopard has not changed its spots. I am resigning my party executive position. Today, in light of the results of yesterday’s election, in a manner true to my promise, I submitted my resignation, which the Jobbik presidium accepted. Jobbik will hold a congress in the near future for the purpose of selecting new party chairman. I am not running. At the same time, I indicated to the presidium that I will not take my seat in parliament. Gábor Vona has failed, but Jobbik lives. If, however, Gábor Vona thinks that he has not failed for good, and his resignation is merely for appearance’s sake, then he will destroy Jobbik. In an earlier post Vona held out the possibility of returning as Jobbik’s chair. However, a second Facebook post made it clear that he was withdrawing from party political life altogether. So it is now out in the open: László Toroczka is going to run for the post of Jobbik chair and leader. If he wins – and he has a very good chance – Jobbik would take a sharp turn to the right. We will witness the return of the paramilitaries to centre stage and even more aggressive racist and anti-migrant words and deeds.